A beautiful recipe for autumn! With temperatures getting cooler, there is a growing desire for good old comfort food. 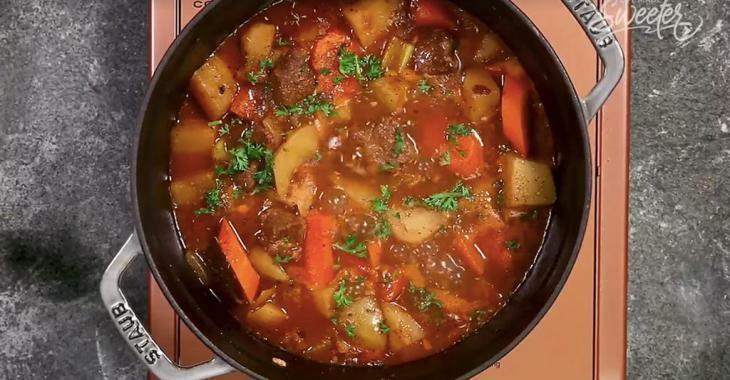 This beef stew recipe is a timeless classic, but it's an absolute must-have in the fall. Nobody can resist this delicious boiled vegetables and tender beef cubes! 1.In a large Ziploc bag, combine flour, salt, pepper, onion powder and 1/2 teaspoon of Italian seasoning. Add the meat and mix well to coat the beef. 2.Adjust the slow cooker to saute, add the cooking oil and cook the meat on all sides, cooking to medium-rare. Make sure you do not overfill the slow cooker all at once; it is worth taking the time to divide the meat into several portions. Transfer the meat on a large plate. 3.Cook the onion and garlic for a minute or two in the slow cooker, then add the balsamic vinegar and the tomato paste. Cook about 1 minute. 4.Return the meat to the slow cooker and add the potatoes, sweet potato, carrots, celery, Worcestershire sauce, the rest of the Italian seasoning (2 teaspoons), the bay leaf, beef broth and star anise. Mix to blend well. If the liquid does not completely cover the mixture, add water. 5.Cover and cook for 20 minutes under high pressure. Then leave to rest uncovered for at least 15 minutes, correct the seasoning, remove the star anise and serve hot, sprinkled with parsley, to taste. Note: This Slow Cooker Beef Recipe gives about 10 servings. To thicken the stew mixture a little, add 2 tablespoons of cornstarch in 3 tablespoons of cold water and add to the mixture.